Miranda Albright was born and raised in Wichita, Kansas. She was drawn to massage therapy by her passion to help people. She has a spunky little 6 year old daughter, Emma, who just started 1st grade! She attended massage training at Heritage College in Wichita, Kansas. Miranda has been practicing since 2012 and specializes in deep tissue, trigger point therapy, hot stone and Swedish massage. Miranda has great strength and enjoys doing bodywork; she has a quiet, nurturing, intuitive touch. Clients are left with a sense of deep relaxation and a restorative therapeutic connection. If you want someone with strong hands who can work very deeply, Miranda is ready to help you achieve your wellness goals through massage. 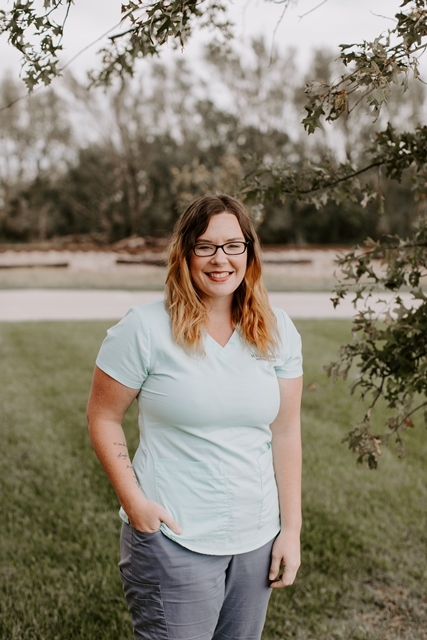 Miranda puts her client’s needs first and is dedicated to helping people manage their aches and pains, while educating them on how to maintain their muscle health. She is licensed by the Kansas Division of Professional Licensure. Miranda will work alongside the doctors’ in the office as they serve their mission to provide quality healthcare in a safe, friendly environment. Call us to schedule an appointment with Miranda!